Sherline exists because of the strength and vision of Joe Martin. Born and raised in Rhode Island, acquaintances would notice that several decades of living on the West Coast never totally erased his New England accent. He was a self-taught entrepreneur who found his way to the business world by being a hobbyist who was never satisfied with the products available. Sherline was the perfect business for Joe. His love of machine tools is evident not only in his product line but also in his modern manufacturing facility. When Joe designed a new product he did it all. 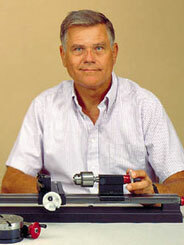 This included the CAD drawings needed for production, the method of manufacturing, and the design of the tooling if needed and then he wrote the instructions. 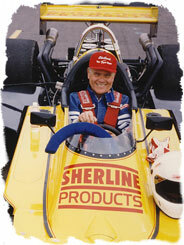 Joe was owner and driver of the Sherline-sponsored vintage IndyCar. Joe was competitive by nature and was one of the founders of the sport of Formula 1 radio control airplane pylon racing as well as one of its early champions. He raced sailboats of all sizes and open wheel racecars…a Formula Ford (he was SCCA 1994 San Diego Regional Champion in that division) and a restored 1974 Vintage IndyCar. In the past his “need for speed” was also indulged with regular trips to Maui to windsurf where the wind and surf offer more challenge than San Diego’s usually mild breezes. He claimed he was getting too “crispy” to indulge in these sports anymore but still enjoyed occasionally running his vintage IndyCar at California Speedway at demonstration events. He also loved racing Norlin 2.4 sailboats, which are scaled-down replicas of 12-meter yachts. You climb inside the hull like a racecar with only your head showing. Seeing a fleet of them racing causes lots of double takes, because it looks like the America’s Cup has come to town in miniature. 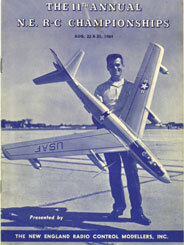 Joe in 1964 with B-47 model he designed, built and flew. Joe was always an avid model builder as the photo on the program cover for the New England R/C Championships from 1964 shows. He had built and flown many aircraft models from scale replicas like this B-47 to experimental designs of his own, both for fun and in competition. The details and designs for Sherline’s machines and accessories are born in his ever-active mind, often in the very early morning hours. He tended to design things in his head, often going through many versions searching for the simplest and most direct solution to a problem before he committed anything to paper or metal. 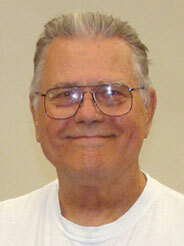 Joe remained involved in many aspects of the business but never liked the “business part” of business. What he liked was buying new machines and finding ways to improve production rates. He was totally committed to assuring that Sherline tools remain the world’s best tool value. For the day-to-day operation of Sherline Products Joe relied on Charla, Karl and Craig to keep everyone associated with Sherline happy. In a company the size of Sherline, the top employees have to wear many hats. Charla’s job is the most visible. She watches over the financial matters, but her main job is to keep Sherline running smoothly. Karl’s job is to see that top quality components are produced on time in our modern factory. With Joe’s passing he also now handles new product design. Craig takes care of advertising, marketing, instructions and customer relations as well as acting as director for Joe’s non-profit foundation for Craftsmanship and curator of his craftsmanship museum. © 2019 Sherline Products. All rights reserved. No part of this web site, including the text, photos or illustrations, may be reproduced or transmitted in any other form or by any means (electronic, photocopying, recording or otherwise) for commercial use without the prior written permission of Sherline Products Inc.